Every now and then I'll find something that just cracks me up! This article from 1971 or 1972 is definitely one of those items. 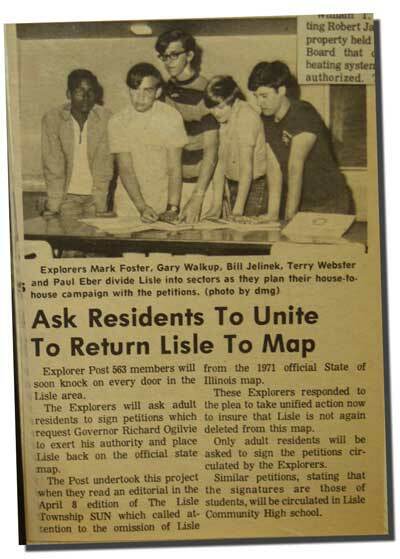 Remember growing up in Lisle and your curiosity as to why Lisle was never found on any maps? Not even the Illinois map that had the "Chicago and suburbs" on the opposite side had Lisle listed! Oh sure! Naperville showed up and Downers Grove was always there but what was the deal with Lisle? Well just look at the faces of these determined young men of Lisle! They weren't taking this sad fact sitting down folks!! No small town "inferiority complex" for these guys. They were on a mission! A mission to get Lisle on a lousy map for crying' out loud! Well... After all these years I bet these guys would be happy to know that I just looked at a fold out map that I bought at a Mobile On The Run and guess what? Lisle was actually on it!